In October I was was invited by the Portuguese Cork Association (Apcor) to visit portugal to see how cork is harvested and made. I was so excited to get this once in a lifetime opportunity to view this process in person. Cork is such a huge part of my business that I jumped at the opportunity to learn more about cork so I can be even more versed on the materials I use. APCOR was so lovely to work with, they made me a 2 day schedule in which they toured me around the south of Portugal where the Cork Oak Trees are grown and also the north of Portugal where the cork is remade into blocks and wine tops. On the first day we visited the cork oak forest inside the Montado at Companhia das Lezírias. I think this was by far my favorite part of the trip, just seeing where everything started from the beginning. They explained to us the importance of the Cork Forest to Portugal's terrain. The trees regulate the water in the area, stabilizing what is needed for the plants and growth around it. The tree is so important that it actually is a national treasure in Portugal. If you read my Cork 101 page, you would know that the cork oak trees are not cut down. Cork is actually is the outer bark of the tree! The bark is removed from the tree every 9 years, waiting until it is fully grown back, making it 100% sustainable. The trees (as seen below) look like their skin is taken off and is a bright orange-red when first removed but as the bark grows back it becomes darker with time. With the bark taken off the tree, it actually makes the tree look naked! It's a pretty surreal experience walking through it and seeing all these naked trees! The bark is still taken off by skilled craftsman to this day, there is no machine work during this process. The tool they use has been used for generations; the chopping blade on one side and a flat tapered handle for prying off the bark on the other. Trees are never planted as a farm and are meant to produce naturally, which I thought was a very healthy and green approach compared to how most industries work. I was in awe of the thoughtfulness of how the cork forests are treated and worked, since it is a national icon, Portugal has strict laws so companies can not harm the trees or harvest them any faster. You even have to ask the governments permission before you can chop a dead tree down! Above, Rui is showing us the tools and how they remove the bark in the cork oak forest. After the forest we visited Amorim's harvesting facilities. The bark sits in this space (5 football fields long!) for 9 months waiting to dry naturally so the natural chemicals in the cork can stabilize. They then check each piece of cork by hand to see the quality. Then grade it and categorize it based on it where it will end up. It could be used for a cork top for wine, cork blocks or cork flooring and insulation. 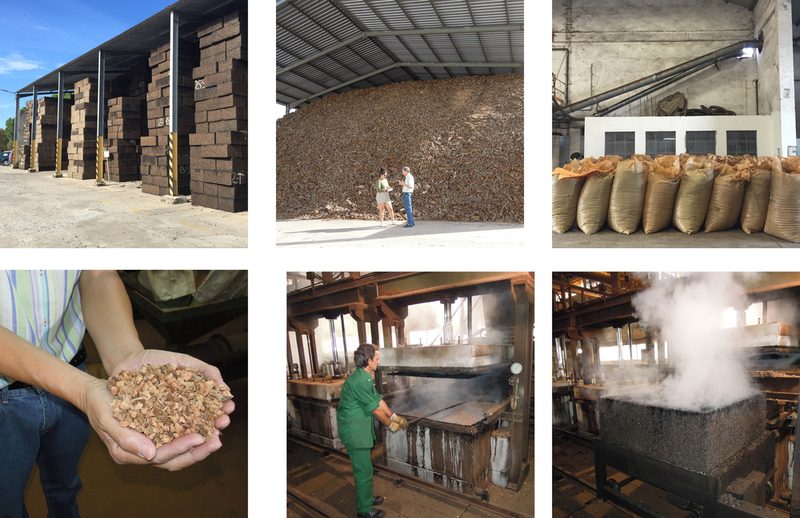 At the Amorim Factory, Raul (Amorim) and Mariana (APCOR) are with me in the bottom shot! I was 100% impressed by their no waste laws, the cork is so expensive to harvest that they try and use every single bit as possible to make something. Even using the dust to power the boilers for more energy! This industry is green in every way possible. Our last stop of the day was with the making insulation cork blocks, another part of the Amorim Company. They walked me through the factories and showed me how each block is made. It was a very interesting process and I was totally in awe that the material has such a life before it gets to me! The "black" cork turns black because it is steamed in extremely high temperatures to essentially activate natural chemicals to bond the cork together naturally. There is no glue or adhesive holding it together, just natures magic! The second day was actually a full weekend for us because we had to travel 3 hours from Lisbon, and go to Porto! It was my first time in that city so I was pretty excited to tour! We saw how all the cork blocks were made from start to finish and it was definitely eye opening! I totally geeked out and asked a million questions on how each block was made. I was truely in cork heaven! Below are different applications of cork, from a soccer ball to skateboard, you really can made anything! My trip to Portugal was enlightening and so much fun. I couldn't have been more excited for the opportunity to learn more about the material I have fallen in love with! Thank you APCOR for making this trip so easy and seamless. This will definitely not be my last trip! Myself with the President (João Rui Ferreira) and Vice President (Carlos Manuel) of the Portuguese Cork Association!